[Update]: This article was updated on April 19, 2017. For organizations who take data security seriously, control over information stored in mailboxes is a must. Starting with Exchange 2010, Microsoft accommodates this need by providing the “mailbox audit logging” functionality. The solution lets you track actions performed on user mailboxes and shared mailboxes by a user, as well as obtain information about his or her computer’s IP and name. By default, logs are collected for every mailbox for which „mailbox audit logging” has been switched on via Exchange Management Shell (EMS). The log files are kept in individual mailboxes in the Recoverable Items folders and cannot be viewed via Outlook, OWA or any other client level access points. The default log file retention period is 90 days, but it can be easily changed using EMS. Enabling In-Place Hold or Litigation Hold for a mailbox does not affect the retention period setting. 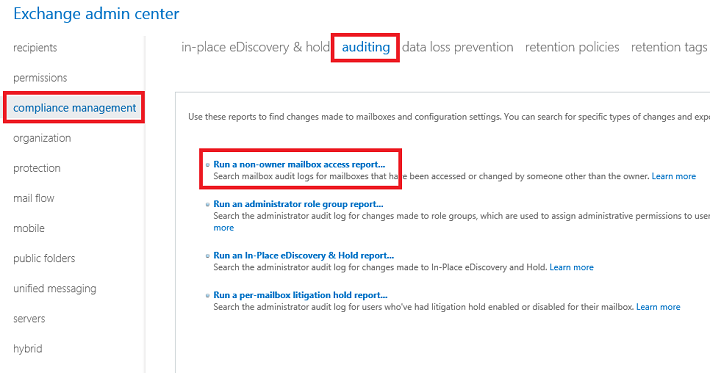 NOTE: Most of the below information also applies to auditing in Office 365 (for more details go to https://technet.microsoft.com/en-us/library/dn790283.aspx) and Exchange 2016 (for more details go to https://technet.microsoft.com/en-us/library/ff459237(v=exchg.160).aspx). Mailbox audit logging can track actions performed by 3 types of users: the mailbox owner, mailbox delegate, and administrator. By default, when you enable auditing, only selected actions by the administrator and delegate are logged. This setting can be adjusted using the -AuditOwner, -AuditDelegate, -AuditAdmin parameters and specifying mailbox actions that should be logged. As you can see the Mailbox audit mechanism offers a wide range of tracking options, which is more than enough to apply in a critical business scenario such as monitoring shared mailboxes. In the output, you will find all the audit information related to the mailbox. From this moment on, as intended, log files will contain information on all actions listed in the above PowerShell output (included item moves and hard deletions performed by the mailbox owner) and will be retained for 60 days. Important! The log files generated by the Mailbox audit mechanism may cause users’ mailboxes to grow very fast and take up a large portion of disk space. The log files are stored in the “Audits” folder in Recoverable Items and are not accessible to the user. To search Mailbox audit logs via ECP, in the ECP console go to compliance management, auditing. Keep in mind that the ECP allows you to only get information about actions performed by non-owner users. 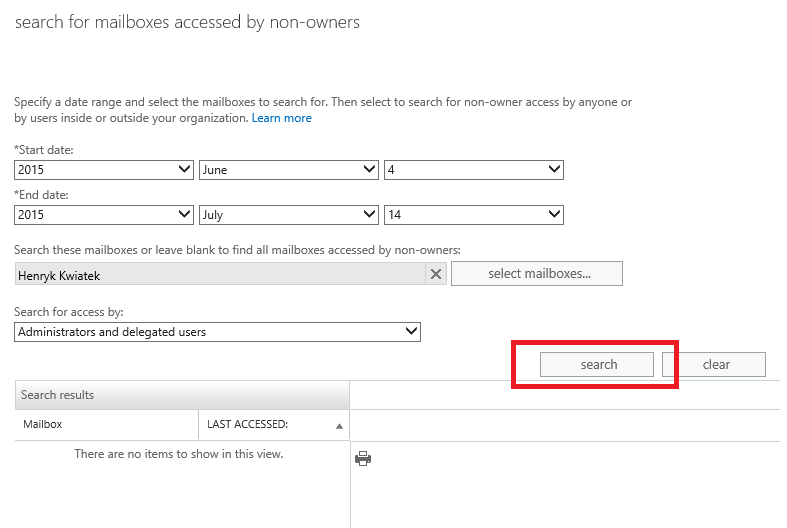 Starting from Exchange 2013 you can search audit logs simultaneously in multiple mailboxes and send the search results to one or more selected email addresses. The mailbox audit logging mechanism equips the administrator with the ability to track the actions that are performed on a mailbox. It is especially useful when it comes to shared mailboxes accessed by multiple users, and any other mailboxes containing sensitive information. The mechanism allows you to determine who performed what type actions on these mailboxes, which can prove critical when there is a need to establish responsibility for caused damage. The Assign mailbox has auditing enabled and the proof is that I can run reports and get results in the ECP for non-owners. I want to get results in the shell for auditing the owner (and non-owners) deleting emails. I have run every version of this command I can think of and no results. No errors either. Any help would be greatly appreciated. The most common cause for this issue is a problem with search index. The cmdlets below will verify if indexing is enabled and if the search index is healthy. I also recall that there has been a problem if the server’s language is set to anything other than English. Is there any way to delete the audit logs? Are audit logs taking too much space? The audit logs are deleted automatically when a specific entry reaches its age limit. I recommend using the Set-Mailbox cmdlet with the right -AuditLogAgeLimit parameter to control when the audit files are deleted. How can I do the same for audit / logging public folder mailxbox.? As to tracking deletions, in MFCMAPI, after logging on to a session and opening the public folder store (right-click and select Open store), expand Root Container and IPM_SUBTREE, right-click the public folder and select Other tables, Deleted contents. The resulting window will contain a list of deleted items along with information who and when deleted the items (PR_LAST_MODIFIER… and PR_LAST_MODIFICATION_TIME properties).